Call recording is a missing feature for Samsung galaxy devices specially after updating to Android 5.0 Lollipop update. This method will enable the hidden native call recording feature on different models of Samsung galaxy S4, S5, Note 3, Note 4 and almost any Samsung galaxy mobile phone running on Android Lollipop, KitKat, or Jelly bean. In this post we will show you how to enable call recording on galaxy phones, by adding the “Record” button instead of the (+) “Add call” button in calling screen. Call recording isn’t legal in some countries because its illegal to record the call without explicit permission from the other party, so that Samsung doesn’t add this feature to all countries and its limited only for few countries, So make sure to check your country or stat’s law before enabling this feature to your device. If you use (+) “Add call” feature, don’t follow this guide because you will not have it after applying the changes to your device. However this guide is extremely easy, you have to follow this tutorial at your own risk. Rooted Samsung galaxy S4, S5, Note 3, Note 4, or any galaxy device. Installed any root explorer allows you to edit system files (ES File Explorer is recommended). Not more than 5 minutes from your time. Find “others.xml” file (Some devices doesn’t have “others.xml” you might find “feature.xml” file instead) to take backup before modifying it. Now open “others.xml” file (or “feature.xml”) as text in “ES Note Editor”. Save the changes to “others.xml” file (or “feature.xml”) then Reboot, to apply the changes on your device. Once you restart your device you can check the record button by receiving or making a call, you will have 2 options Start and Stop recording in calling screen. The saved recording files will be saved to “voices” or “call” folder in the internal storage. You can revert the changes that you applied to your device at anytime by restoring the backup file step 7 or by deleting the created line step 11. I did it in my s4 GT-i9505 and worked very nice without problems.. Seems like the comment-script here has filtered some parts of my message. 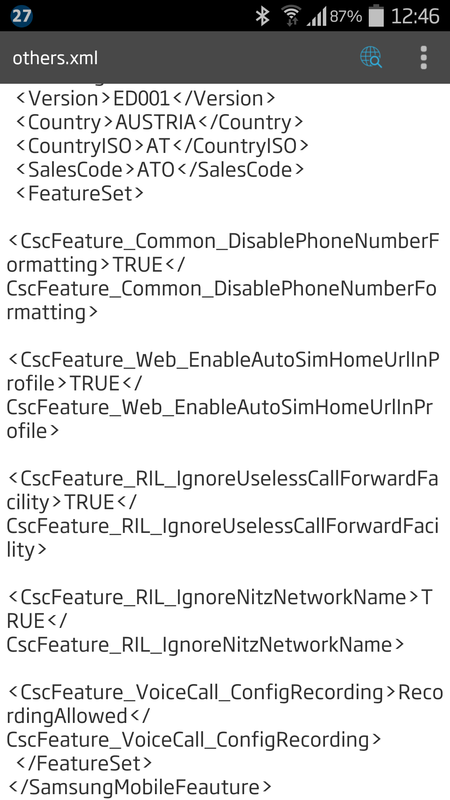 Again: In my file it’s “SamsungMobileFeauture” and not “SamsungMobileFeature” at the beginning/start tag and at the end tag. And I don’t know why. Strange is, that at the top is “” and at the end also “” – there’s an “u” too much… But I never changed that. Why it’s “Feauture”??? Hi, does not work on my GT-I9515. Have now root and added the line, restarted the phone, but there’s always the “+ add call” button. Why? Thank you for your article. So I get the recording button on my GalaxyS4 L720 And 4.4.2. And I touch the record button during call, It’s pop up “Recording 00:00” by red text. But time was not counted. It kept 00:00. And In case of using other auto call recording, app run well, but no file after recording. I have Samsung Galaxy S4, I have call recording option, but unfortunately its not recording my calls. Can you explain what happen if your hit record button please? When i click on root explore it says sorry test failed this feature can not run on your device. Please let me know if there is any way to continue it. You are using which root explorer? Good post!!! I sucessfully do it. My Smartphone is Samsung Galaxy E5. No error! Everything is okay. A lot of thanks. I searched for this error but have not found any satisfactory resolution.